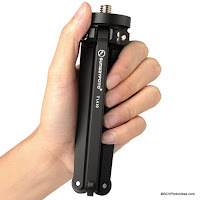 Sunwayfoto® made its debut in the tripod market almost a year ago, in October 2014, by releasing a small Aluminium tabletop tripod the T1A10 as described in the relevant Article. As I had mentioned therein, they had already declared their intentions with the announcement and exhibition of a range of Tripods consisting of tabletop, traveler and classic models, made of Aluminium and / or Carbon Fiber. With a lot of tripods makes coming from China nowadays, Sunwayfoto has chosen to differentiate with some unique characteristics but also by taking their time testing and altering designs, before releasing the final products into the market. Last month (August 2015) was a busy month for Sunwayfoto engineers and stuff as they prepared the release of not one but three new tripod models simultaneously. Since I have actively participated in the pre production evaluation processes of the new Carbon Fiber tripods, I can confirm that attention to detail and quality have been and remain the top priorities. The first of the three, is the T1C40T presented here. 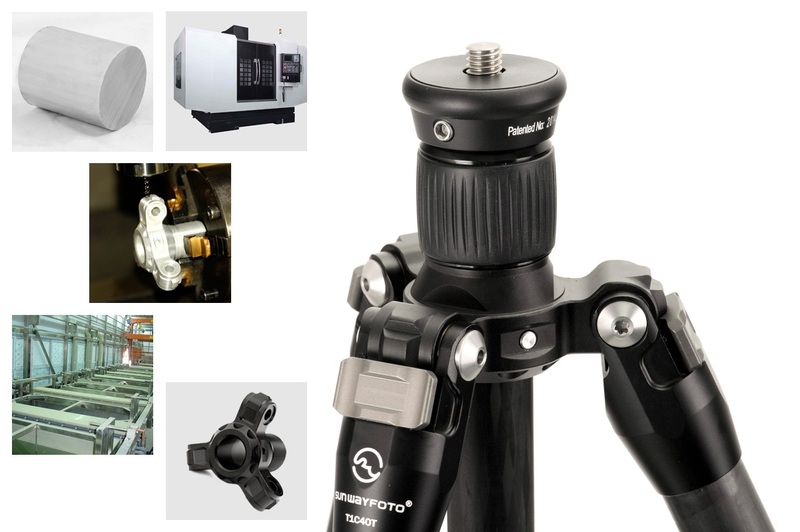 A very compact and lightweight Carbon Fibre Traveler tripod with a 24 mm top leg diameter, targeted to the high end market segment with a very competitive price, compared to the competition. At Sunwayfoto, maintaining their own quality standards, they have avoided any cut-offs in the production processes in order to present innovative features aiming at superior stability and durability. Something unique for a non cast tripod, is the spider of the T1C40C, which is a single piece of solid metal. It is CNC machined out of a single block of Aircraft grade T6 Aluminium and then type III hard anodized, offering improved rigidity with high abrasion and corrosion resistance. Sunwayfoto T1C40T features a single block top spider promising improved rigidity and torsional resistance. Innovation continues with a Patented mechanism for the leg joints of the new Sunwayfoto Carbon Fiber tripods, which promises a maintenance free unfolding and folding of the legs. 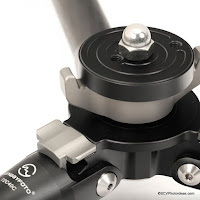 Two screws passing from both sides on a rotating shaft are usually found on most tripod leg joints. Either screw after a while loosens up due to friction between the parts inside the hinge on the spider. Even the use of washers does not suffice, especially on tripods with reverse folding legs by 180° where the twisting movement in unfolding and folding is greatly extended. Therefore, after some time readjustment of the screw tightening is necessary. The Sunwayfoto patent involves a rotating shaft with a couple of slots on its end cap which coincide with two anti-twist bosses on the upper leg joint. 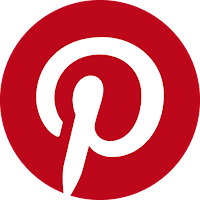 In this way when the tightening screw is inserted and tightened from the other side it will remain fixed with the rotating shaft on the leg joint. When the leg is twisted during unfolding / folding the screw / rotating shaft assembly will always twist together with the leg. Therefore, any loosen-up due to friction between the screw/shaft and tunnel which forms the hinge on the spider will be avoided. Sunwayfoto claims that after twisting the legs thousands of times in their QC department no leg loosening up was diagnosed. Another advanced advertised feature of the new Sunwayfoto tripods are the CNC machined Leg Angle Locks. Meaning both the push-pull lock Latches and the Steps on the leg-hub (spider). This technique, due to the latches and the steps being at right angle ensures a larger contact area between them further enhancing the leg stability. In comparison, other brands use lathe to form the steps in order to minimize machining time, thus cost, resulting in a rounded shape of the steps with minimal contact area with the lock latches. 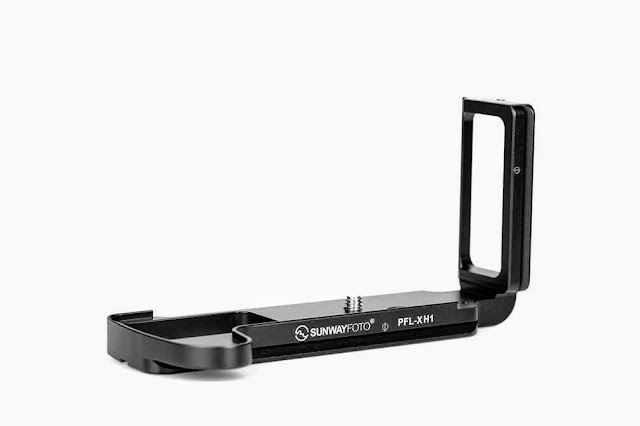 Unlike many plastic or soft metal spring hook assemblies, Sunwayfoto has equipped the T1C40T with a Stainless Steel rotating, spring loaded, hook assembly which is rated for holding weights up to 15 kg. The Sunwayfoto T1C40C shown with legs folded 180° backwards revealing the design of the bottom of the leg hub / Spider and the Stainless Steel hook assembly. The hook assembly is also equipped with a stainless steel tube extension sporting a 3/8"-16 thread. In this way the hook assembly, combined with the top mounting plate and mounting stud transforms the tripod for ground level shooting without a center column. Sunwayfoto T1C40T converted for ground level shooting. Among the features of a tripod that usually passes unnoticed are the Teflon or Nylon inserts between the successive leg section tubes, which are responsible for the air-tightness, anti-twist function and smooth retraction and extension of the sections. Sunwayfoto has decided to sacrifice some cost in return for enhanced leg stability when the legs are fully expanded, by using 40 mm long inserts or "friction tubes" as they call them. For comparison, the usual length found in other brands is 30 mm or less which results in less tube remaining in each upper section of each leg, when fully extended. It is more economic, saving 10 mm or more of leg material per section but less stable, resulting in greater flex of the twist lock joints. The top mounting plate of the tripod is equipped with a side hex socket screw which fixes the plate on the long center column. The top plate mounting stud has a dual thread 1/4"-20 on one side and 3/8"-16 on the other and is made of Titanium alloy for extended durability. All rubber twist locks have a smooth texture for more convenient handling and promise improved dust resistance. A convenient carrying bag is included in the package as well the appropriate Torx and Allen wrenches. First looks of tripod use came from the beach advertising the tripods weather resistance and stability on all terrain. Sunwayfoto T1C40T is shown above with the Sunwayfoto FB-36II medium sized ball head attached and Nikon D600 DSLR Camera captured on a wet, slippery rock beside the beach. A studio shot of the Sunwayfoto T1C40T with Sunwayfoto FB-36II ball head attached, but with the center column removed. Once again holding the Nikon D600 DSLR camera fitted with a front heavy lens. Great effort has been given by the Sunwayfoto Marketing team for the preparation of the web pages for the new tripods, which are among the most extensive I have ever seen. Aside of basic characteristics there is a thoroughly illustrated presentation of features and full description of all tripod functions. It's rather like a full featured on-line manual than a simple page. The translated English is not perfect but still very comprehensible. For more information you may visit the T1C40T Carbon Fiber Tripod page at Sunwayfoto's website. As one of the latest production samples is already in my hands, stay tuned for a full featured review in due course. Since most features are already well described, we shall concentrate there, on how the design elements and said features prove themselves in real life. If you are interested in the product or any other product, please consider using above link(s) to make a purchase and help support this site. Your support is needed and greatly appreciated.